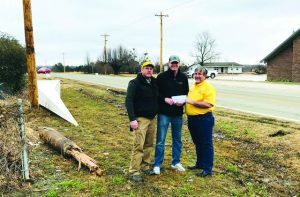 GORE—On Fri. Nov. 30, two tornadoes hit northeastern Oklahoma, causing damage to several communities. Oklahoma Baptist Disaster Relief (DR) immediately responded by setting up a command center at the associational camp grounds, Tenkiller Baptist Assembly. Joe Taylor, Tim Hare, pastor of Blackgum, First and Don Williams in front of the church, which lost its steeple, far left, in the tornado. According to Don Williams, Oklahoma Baptist DR state director, the first tornado touched down near the town of Gore and traveled for an estimated 50 miles, damaging Blackgum, First. 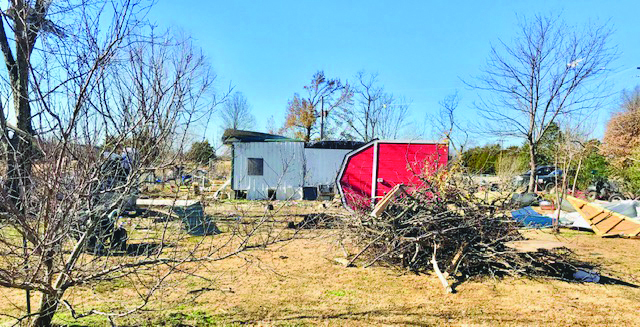 The second tornado touched down near Cookson, damaging many homes along Lake Tenkiller as well as the lake’s docks and marinas. 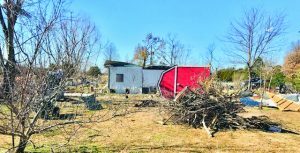 Williams said emergency managers estimated more than 150 structures sustained damage following the EF-1 and EF-2 tornadoes. “We will help with churches and staff, then church members, and, finally the communities,” Williams said. Jim Bronk, pastor of Cookson, First told Williams about how the storm has impacted families in the community. Assessors, chaplains and chainsaw teams trained and equipped to do relief work are serving in the area. For the latest DR updates or to make a tax-deductible donation, visit www.okdisasterhelp.org.